The ORION™ laser module builds upon the proven performance of RIO’s game- changing PLANEX™ product series. 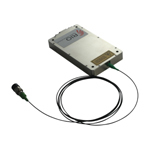 In addition to unrivaled reliability (Telcordia GR-486 qualified) and robustness, the ORION laser modules provide superior value with up to 20mW output power, very low RIN, ultra low phase noise and narrow linewidth, exceptional wavelength stability and insensitivity to vibration. Copyright 2002 Hikari,Inc. All rights reserved.